Overview: Creates the illusion of a 3D image when tilting the phone. 3D depth effect works best with images with strong edges. To start, long-press on an open area on your homescreen, select Wallpapers, Live Wallpaper and then pick 3D Image Live Wallpaper from the list. THIS THEME IS FOR MDPI/HDPI AND XHDPI PHONES ONLY. ROOT needed and a custom ROM like CM10/CM10.1 or AOKP-MR1 needed that supports the Theme Engine. * I have made new widget for gmail + reverted inside the application to stock, everything is stock except sender name it's ubuntu orange, there was to much issues with gmail label text etc..
* Reverted mms preview textsize to stock "fix for mdpi devices"
* Lot of fixes etc..
Overview: Cardstock is an icon pack for replacement launchers such as Nova, Apex, ADW, Holo and Holo HD. The icons are flat, minimal, and elegant in design. There are +325 individually themed icons! The app drawer icon didn't theme? The app drawer icon must be applied manually. (The apps within the app drawer all theme correctly, this is just referring to the icon for the drawer.) To do so, click and hold the icon on your homescreen and select 'edit', then click the icon picture. Choose icon pack, then Cardstock and scroll to your icon of choice. I try to update at least once a week, or as family time allows. It will be supported for the long run, so you can rest assured it is a good investment. Does this work with GO Launcher? My title was written without hyperbole. I have a long history of using uniformly colored icons, to suit whatever theme/wallpaper I was rocking at the time - this set is the first that is a multitude of colors that I've ever used for more than a minute. I've been rocking them for well over a week, using a wide variety of backgrounds and themes with them. Buy them. Right now. Stop considering whether or not it's worth it, because an authority is declaring to you loudly that it is. They're worth it at triple the price. If you don't like them, please let me know, because I want to personally yell at you about your poor taste. I'm only joking about that last bit. Sort of. Seriously, though... these are fantastic. Buy them! Awesome icon set, get it now! Very cool icon set that gives a vintage and unique look along with the lifted look that makes it that much cooler. Buy it, you won't regret it! Love having this pack on my phone... Also love being able to connect with the dev and find other easter eggs when i open the icon pack from the app drawer! 100% recommend! ✔ includes beautiful full go launcher theme. ✔ long time support, responsive themer. To calculate the Thomson keys, a dictionary file is required. Our dictionary is only a 66Mb single file, which is smaller and more efficient than anything else available on the market. This file should be downloaded by default to your SD card, though you can select the folder where the file is on the preferences menu. Alternativly we can use your Internet connection instead of the dictionary. This option can be activated in the settings menu. It also can calculate natively the key although it will take about 2 minutes in less powerfull phones and about 10 seconds on a Samsung Galaxy S. This tool also detects the new 2010 Thomson routers for which keys cannot yet be generated. Overview: Inline Music Player is a new, innovative and lightweight media player based on the popular player foobar 2000. Inline Music Player has been developed as an alternative to popular music players that have no full control of your playlists. Inline Music Player is a new, innovative and lightweight media player based on the popular player foobar 2000. Inline Music Player has been developed as an alternative to popular music players that have no full control of your playlists. Enjoy the highest sound quality, create your own playlists and all that with the minimum consumption of your battery. Do you have any ideas? Any problems? Contact us! This version is completely free with no time restrictions. Purchase Inline Music Player Unlocker to unlock all of premium features. AudioFx Widget is a widget that can be applied audio effects to audio output on your multimedia player. - This widget was tested on Nexus One (2.3) and Galaxy Nexus (4.0) only. This app uses the audio effects engine that is standard with Android OS. Some devices may have incomplete support for this feature. In this case, some or all of the functionality does not work, it may also cause skipping and distortion. These phenomena can not be solved by the application. Please be forewarned. Fixes a issue does not appear in the widgets tab. Please update the following procedure. Universal assistant for solving mathematical tasks for pupils and students, which allows you not only to see the answer to the task, but also shows a detailed solution. Derivatives, limits, geometric shapes, the task of statistics, matrices, systems of equations and vectors  this and more in Math Helper! The latest update 3.0 contains fixes of some bugs in "Vector algebra" and a new design. MathHelper is a universal assistant for anyone who has to deal with higher mathematics. You can be a student of a college or graduate, but if you suddenly need emergency assistance in mathematics  a tool is right under your fingertips!  6 topics and 41 sub-section.  Localization for Russian, English, Italian and German.  Intel ® Learning Series Alliance quality mark.  In the paid version of the application you will be able not only to solve the problem, but also to trace the process of solving it.  The application is equipped with a convenient multi-function calculator and extensive theoretical guide in several languages. Application MathHelper is indispensable during exams, writing sessions and examinations! And even if you have already grown out of student uniforms and jeans, you may sometimes emergently need a universal mathematical reference book-calculator! 1. Linear Algebra - Operations with matrices (7 subsections). 2. Linear algebra - Solving systems of linear equations (3 units). 3. Vector algebra - Vectors (9 sub-sections). 4. Vector algebra - Shapes (subsection 4). 5. Mathematical analysis - Derivatives (3 units). 5. The theory of probability (subsection 4). 6. The number and sequence (11 subsections). Discover a new shape of mathematics with MathHelper! -Languages currently available in Wikipedia Encylopedia are English, Dansk, Deutsch, English, Español, Français, Indonesia, Italiano, Lietuvių, Magyar, Nederlands, Norsk, Polski, Português, עברית, Bahasa Melayu, Česky, Română, Slovenčina, Slovenčina, Suomi, Svenska, Tiếng Việt, Türkçe, Volapük, Winaray, Български, Русский, Српски / Srpski, Українська, العربية, فارسی , 한국어, 中文, 日本語... and 150 more! NEW: Offline wiki databases can now be downloaded from $3! Overview: Plume is a beautiful and completely customizable Twitter app that will revolutionize the way you use Twitter! NOTICE: THE READ LOGS PERMISSION WAS ADDED TO GET LOGS FROM WITHIN PLUME, ON JELLY BEAN (4.1) THAT IS THE ONLY WAY. LOGS ARE ONLY READ & EMAILED WHEN THE USER DOES SO VIA THE SETTINGS. ONLY PLUME RELATED LOGS ARE USED. Overview: Dungeon crawling on the go. Grab loot, fight monsters, and escape or die trying. Delver is a first person action roguelike dungeon crawl with crunchy pixels. Take the role of an adventurer that tries their fate in the dark dungeons (and probably dies horribly). Fight monsters, grab loot, horde potions, and level up! Quest for the Yithidian orb at the darkest depths of the dungeon and attempt to bring it back to the surface. Getting to it may be the easy part. Levels are randomly generated in each playthrough - you'll never know quite what's around the corner. Overview: Join a range of characters, each with their own distinct personalities, as they travel with the gods through the expansive world of this adventure RPG! 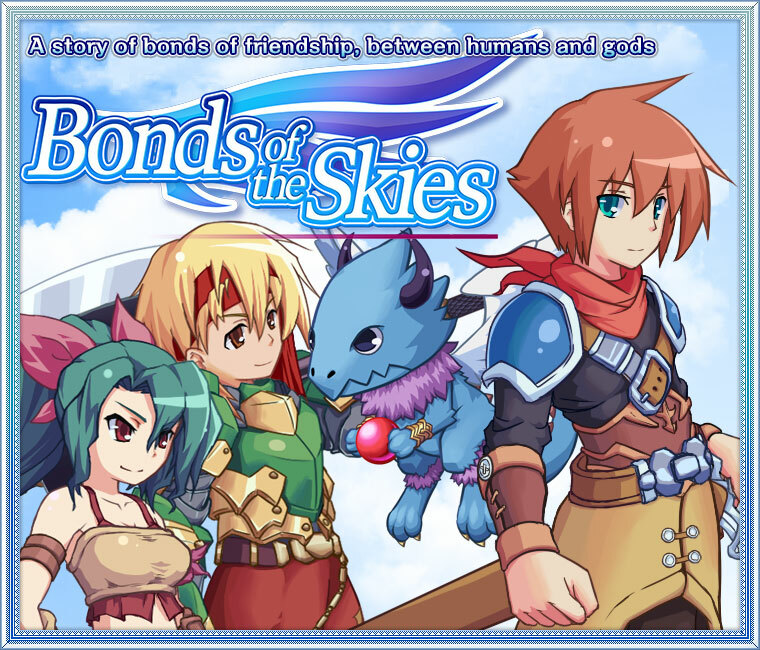 'Bonds of the Skies' is now available! Join a range of characters, each with their own distinct personalities, as they travel with the gods through the expansive world of this adventure RPG! Times are changing, and the existence of the Grimoas (gods) has become less relevant in everyday life. Eil, the main character of the story, is in the middle of his Coming-of-Age ceremony, conducted by the Priest of his town, when suddenly the town is attacked by a demon and engulfed in flames. In the midst of this confusion, Eil enters into a pact with the Air Grimoa, Nogard, in order to save everyone. Eil and Nogard set off to look for the demon who cast the town into a sea of flames, and to find other Grimoas in order to put a stop to the demon's violence. The game features a wide range of achievements, including quests and collecting items! By obtaining Folklore Points (FLP), you can you can buy items to make your progress through the quest smoother, and you can challenge yourself further in extra dungeons. ■ Make the characters your own by using skill sets! You can customize the characters as you want by setting their skills- but be aware of the limited 'cost levels'! ■ Make use of more powerful skills by synchronizing the characters with the Grimoas! If the Synchro Gauge with the Grimoas reaches 100% during battle, you can use special skills, more powerful than normal! You can get one lottery ticket every 24 hours, and take part in the daily lottery! There are gold, silver, bronze and normal prizes. The number of points you will gain depends on the prize you get. ■ The tutorial function makes play easy even for beginners! There are tutorials for how to conduct battles and how to search for items, etc., so you don't have to be an expert to enjoy the game! ■ A wide range of purchasable items! There are many items that can be purchased. Of course there are items to support you on the quest, but there are also many extra items to make the game even more enjoyable! ※ You can play the main game all the way to the end without making any purchases. Overview: Help the little Vampire to make his way through the levels to the objects of his desire: Beautiful pale Princesses with delicious royal blood running through their veins! ✓ More than 35 mind-blowing levels with frightening realistic physics! ✓ Wide ammo range: from plain rocks to magnets, blowing bags, smoke and water! ✓ Use in-game solutions per level should the puzzles get too difficult! ✓ Unlock mysterious bonus levels and find secret gifts! Overview: How brave are you? Brave enough to endure endless combat? To devise new tactics and overcome powerful foes? With an army of Brave Heroes to mix and match, only you can create the winning strategy! A whole new way to play! - Brave Heroes combines the best elements of RPGs and exciting gameplay! - Every hero has unique skills and abilities! - Dozens of heroes and hundreds of strategies! - With so many heroes to choose from, every game is a new experience! Simple UI and great graphics! - A single-tap UI makes it easy to devise and execute even the most complicated strategies! This is a singleplayer game. When deleting or initializing the game, please use the data backup/restoration service in options. Brave Heroes can also be played in 한국어, 日本語, 中文简体, or 中文繁體! - This game has in-app purchases. To avoid extra fees, some items may be purchased through a subscription service. - For the Com2uS Mobile Game Terms of Service, visit http://www.com2us.com. - For questions or customer support, e-mail info@com2us.com. Brave Heroes: The thrilling offense game featuring colorful heroes! Overview: Castle TD: The best stragetic/arcade castle defense ever! Commander, our world is in great danger which weve never faced! Not only orcs, but also goblins, spirits, devils and other monster are trying to destroy us! Build your defense and stop them now!
. Add level 5 for Endless mode. Overview: Fangz is Touch Arcade's forum Game Of The Week! We're getting rave reviews from all top gaming sites! "'Fangz' is a Cool Beat 'em Up that Trades in Zombies for Vampires"
"..you'll be getting a fun and bloody romp.."
"This side-scrolling beat em up is extremely gory, but the vibrant visuals still made us smile." The final undead shooter arrived. 99% rejoice! Here's your chance to make the 1% pay for their sins. Shoot, slash and smash lawyers, bankers and other vampires, in beautifully hand drawn worlds, made by world renowned artist Alex Gallego. - Incredible 2d art. Watch bloodsuckers suffer in superb detail. - Amazingly smooth cartoon animations. - 10 level campaign mode, with a riveting Michael Bay-sized story and amazing bosses. - Store with 17 unlockable weapons and 4 upgradeable player stats. - Easy to pickup, hard to master. Gameplay videos at http://youtu.be/x6-5D6IkD5E and at http://youtu.be/qCuYxL2Lng8 . Please support us by giving Fangz a 5 star review. We want Fangz to be the ultimate beat'em/shoot'em up, and we already started working on some yummy updates. Please continue to support us, so that we can keep Fangz as the best game of its kind. Update: Fangz 1.11 corrects a small glitch in the tutorial. 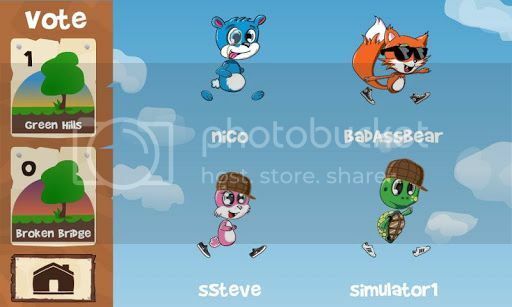 Bunny Bonker is an ultra-cute speed and reflex test game featuring bunnies, payloads and physics! 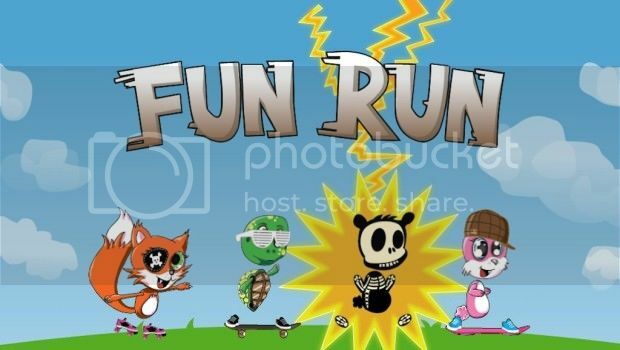 It's a fun and addictive spin on the legendary 'whack-a-mole' arcade game, taken to a whole new level! ★ Physics, Flying Clocks, Freeze Time and Magnets! ★ You get to bonk cute bunnies! For fun! 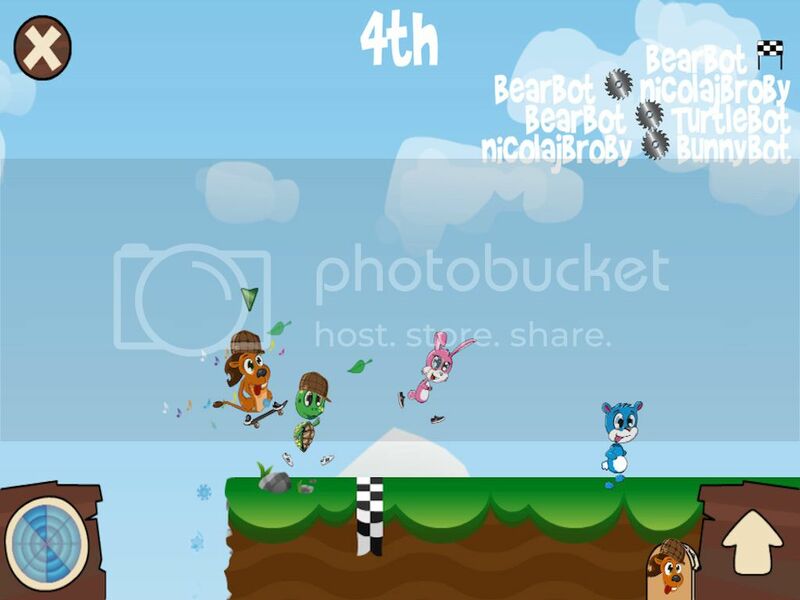 FREE download on the Google Play Store ----> PLAY BUNNY BONKER! Overview: Run, shoot, laugh and respawn!